John's Wiki profile seems to indicate they're back together again. Have they changed the name of a Moscow Mule to a Miami mule yet? Freedom fries and a Miami Mule sound like a chip off the old shoulder! Does a Black Russian sound less racist than a Black Floridian? A Black Russian reminds me of some serious hangovers from 4 decades ago before I learned never to drink sweet liquor in a hard drink. Kahlua is fine...in coffee. Ah the innocence and carefree irresponsibility of youth! When will America be great again??? 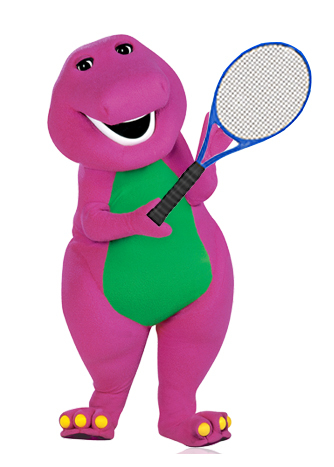 Getting rid of Barney style colored ball tennis for juniors might be the first step. Hell yeah! (yes,that's a green head band). Well, he is Isner's coach. Or Mary Jo Fernandez commentating on a Federer match while her husband is sitting in Federer's box. The article on Isner and Gimmestob was about Justin illegally coaching Isner with covert hand gestures and shouting out during play. When has either Tony Godsick or Mary Jo ever done this or been accused of doing it? Sorry, but this is a ridiculously failed analogy. Darren didn't and isn't helping Simona win a slam. How is he going to help futures? Haha she got the 18 French open now. Yes and how is Mary Jo commentating a conflict of interest at all?? Kahlua and nicely chilled milk is really good too. Clear conflict of interest, because how can you be an objective commentator during a match in which your spouse is the agent of one of the players? Clearly, it's in your best interest that he (Fed) does well.. Really?? Hope you were sarcastic. Let's use some logic. It would be a conflict if she was an umpire or lines person because then she could impact the match. Being a commentator doesn't have any conflict at all. If she did a bad job being objective she could lose her own job and career. Show me some examples where she's commented on Roger's matches and clearly favored him please. And even if she did it would be to her own detriment. As to your question on how you can be an objective commentator when it's in your best interest fed does well... By actually taking your job seriously and being an objective commentator no matter who is playing. You can do this and still hope he does well unless your moral compass is garbage. You said it yourself, it is in her best interest Federer does well. And I'm saying that doesn't matter because she can't make him do well with her commentating. Unless you have proof she has magic words and her commentating makes Federer play better? Yep some are grasping for straws here. Check out my post right above. I'm pretty sure that color is Volt - more of a neon yellow than a green, but that's just me. Oh come now. Take one player at 12 years of age with natural athletic ability and force him to learn to be an all court player. Teach him to serve and volley. Teach him to take the ball early and look to WIN points. Could work. We have access to two of the greatest offensive players ever. Tennis’s war if attrition is a crap shoot. When we talk about great players, for the most part, not always, but for the most part we talk about players that take the offensive. Someone take a chance!!!!!!!! I see real talent here. You should throw your resume into the Trump administration. Lol unbelievable!! By definition, it's a situation where somebody can exploit their position for a benefit. You and some other posters clearly fail to see that she can't actually impact his result whether she commentates in his matches or not. Nor does she get any benefit to herself commenting on his vs other matches. That's kind of the point in a conflict of interest, where actual impact can be made that's conflicting. I would agree if she was allowed to line judge or umpire matches. It’s not much different than when Dell used to commentate on players he represented as agent. Here it’s the wife of agent. There is both a manifest COI (she’s commenting on Brand FEDR the health of which directly impacts her husband’s bottom line) and the appearance of a COI. She has one interest to speak freely without restriction on topics and give an honest opinion as a commentator with the other competing interest being the health of “brand Federer” and if not enhance it certainly not to harm it in any manner. Like I suggested maybe some kind of compliance related position with The Administration where your talent would not go unrecognized. Again. Whether she comments with bias or not, what is the benefit to her standing that she can exploit? What is the benefit to Federer!? Financial? Performance? How can she enhance the brand and if she isn't harming it, why would another commentator choose to do so? That could get them in trouble for not being objective. You're twisting and spinning this against the definition of conflict of interest, that's a very important requirement you will surely use to succeed in our current administration where such skills are the key. When we talk about great players, for the most part, not always, but for the most part we talk about players that take the offensive. Someone take a chance!!!!!!!! How then do we explain this ATG, who refused to come to the net during 2018 Wimbledon even on sitters? Serious question. He ventured near the net once in a blue moon yet won it. All that time off gave him time to read every poast in "Novak & The Net," no? All this crap that Mary Jo has a “conflict of interest” because she’s married to Godsick... First of all, Mary Jo doesn’t commentate during Fed matches. She covers women’s matches and does interviews prior to men’s matches. Also, what about Donald Dell, who did commentate during hundreds of Lendl’s matches when he was his agent? Also Aaron Krickstein. That was pretty bad, but Mary Jo isn’t anywhere near that league. Chris Evert has no connection to Fed, yet openly drools over him when commentating. Koenig does the same with Rafa. All commentators have their biases, but I challenge anyone to point to a single thing Mary Jo has ever said in the booth about Roger that is controversial or even interesting! Yeah, and that's hard to say. Seven Americans in a 28-draw and we can't get one SFist. You mean the ATG who you said had no chance in hell of winning? Priceless.